Another exclusive promotion for all our readers. Vera&John Casino is offering 10 free spins (no deposit required) on Gonzo's Quest slot, one of the most appreciated among the NetEnt slots. And if you decide to make your first deposit, a match bonus of up to £/€500 is waiting for you. Read here how to join these exclusive promo! Welcome to your true online and mobile casino – Vera&John! 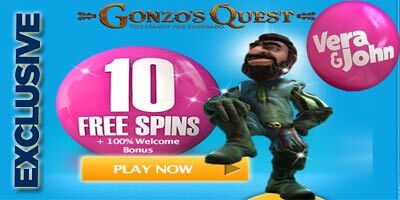 "VeraJohn Casino: 10 free spins on Gonzo's Quest (no deposit required) + £/€ 500 match bonus"